The instagram sewing community is incredibly supportive nurturing and inspiring and it never ceases to amaze me! I happened to mention to fellow instagrammer Suzy Roberts that I adored the fabric of her latest make. A couple of weeks later, she messaged me to say that she had some left and would I like it!! It was so kind and thoughtful, I was utterly overwhelmed!! The parcel came in the post and was beautifully wrapped in a vintage ribbon and even more bright and beautiful in real life!! It is the most beautiful drapey and soft brushed twill with a border print. 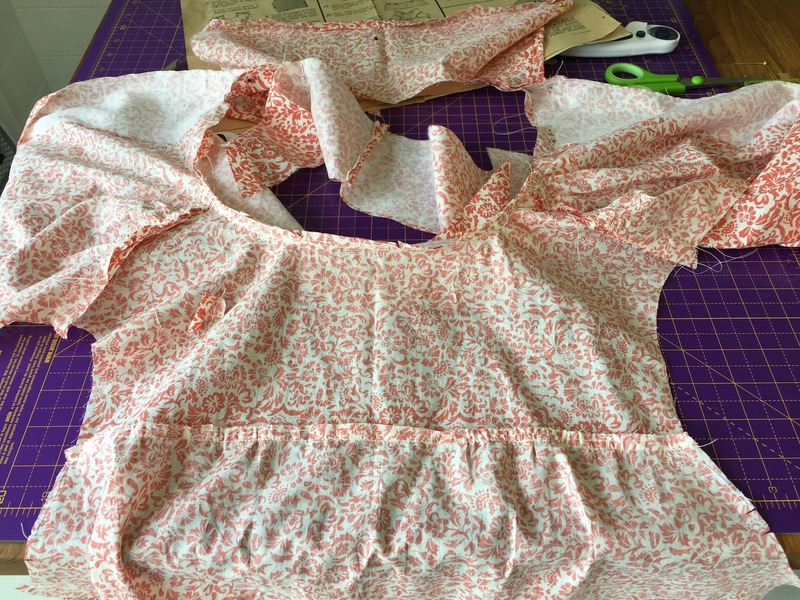 It felt like such a massive responsibility to make something perfect for the fabric, something I would wear a lot and something that would fit me well and not end up on the reject pile! 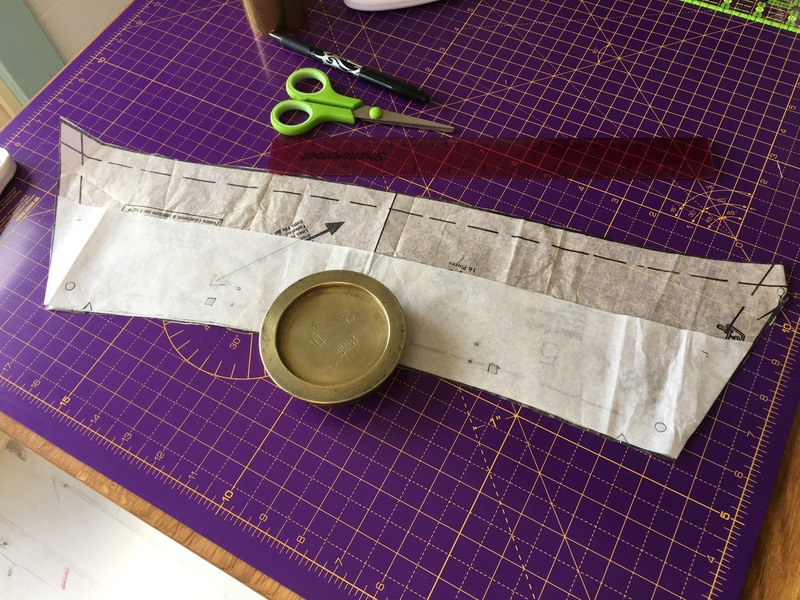 I scoured the internet for skirt patterns as I decided that the border on the edge of the fabric would look perfect as the hem and the darker border for the waste band. I have always admired Karyn Valino owner of The Workroom, a sewing studio and community space in Toronto. I saw her version of the everyday skirt and knew that I had found the pattern. The everyday skirt is by Liesl & Co, a pattern designer from New York. Their mantra is ‘Everyday style that is easy to sew’ and they have a fantastic range of dresses, shirts and skirts. The PDF is a bit different to the usual in that it uses every spare corner and you have to slice some pieces in half and fit them to the corresponding numbers. It was a great use of the paper with absolutely no waste!! The pattern had very clear instructions with easy to follow diagrams and step by step guidance. I made it in a couple of evenings and didn’t have to make any adjustments, the fit was perfect. As the pattern uses elastic on the waistband with no zips or fastenings that also cuts down on the make time. 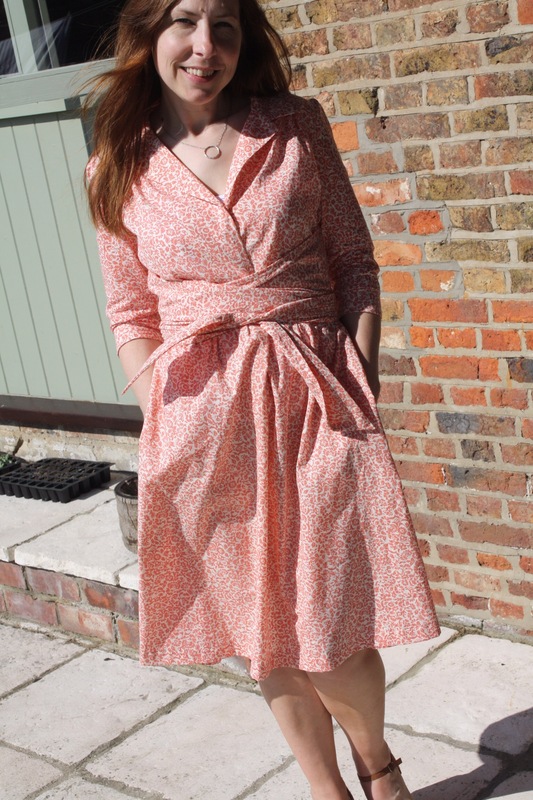 Im really pleased how the bordered fabric works with the skirt and i love the pockets…obviously!! It’s a really fab skirt which could be dressed up or down and I’m already planning my second using some Liberty lawn from my stash!! I have a confession. There is something about those little wooden cotton reels that make me go weak at the knees. I can’t really put my finger on it. It could be the lovely little brightly coloured labels, the stunningly beautiful colours that cling onto their brightness after fifty or more years of life or maybe its the quirky names such as Forget-me-not, Turkey Red or Gay Kingfisher. Whatever it is, my obsession has led to me collecting quite a few of said cotton reels, buying one or a bundle of them whenever I can get my hands on them. Then one day, I set myself the task of collecting all 500 colours. I have a spread sheet (did I hear a snort then) which I must say is decidedly out of character, so that I can keep track of what I already have and what I still need. 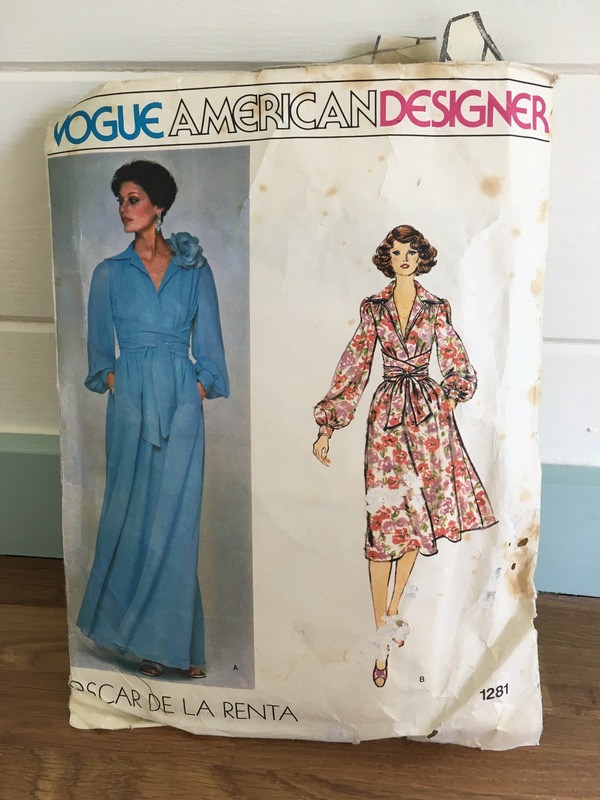 So far I have around 84 and they are stuffed in shoes boxes and bundled onto shelves in my sewing room and it seems such a shame to have such beauties hidden away. As I work in the Antiques trade, I am well placed for finding shelves and cabinets but I decided to make my own ‘made to measure’ shelf unit to display the ones that I have and to grow into as I collect. Firstly, I worked out a simple design and measured my cotton reels to decide how wide I wanted my shelves to be. I also measured an overlocker reel as it will be useful to store these too. I then went to my local wood merchants and got them to cut me nine, 1 metre lengths. As they use a circular saw it ensures that the cuts are at right angles which is vital for accuracy. Using my omnigrid ruler I divided up two 1 metre lengths to accommodate seven shelves, marked them on and then marked two screw holes onto each shelf. Using a drill I drilled all the marked holes, I then used a countersink bit to sink the screws so that they are flush. I then drilled through the side pieces into the shelves and glued and screwed all the shelves together. It is vitally important to line the shelves up exactly and at right angles to the sides and also to make sure that the screws ‘bite’ when tightened up. Then it was just a case of filling the holes and painting it up ready to go on the wall!! Im so pleased with the final result and now I can buy as many Sylko’s as I like!! On the morning of Mother’s Day my daughter produced the most beautiful handmade card (I have 18 years worth kept in a treasured pile in my bedside drawer). She also gave me a Tilly and the Buttons Bettine paper pattern. I was absolutely thrilled as it was pinned into my Pinterest ‘Stuff I want to make folder’ about a year ago. It’s also lovely to have a paper pattern as I often use the PDF style and there is something a little more luxurious about a paper pattern. I had ear marked a vintage fabric that I had found in an antique centre so I was ready to go. 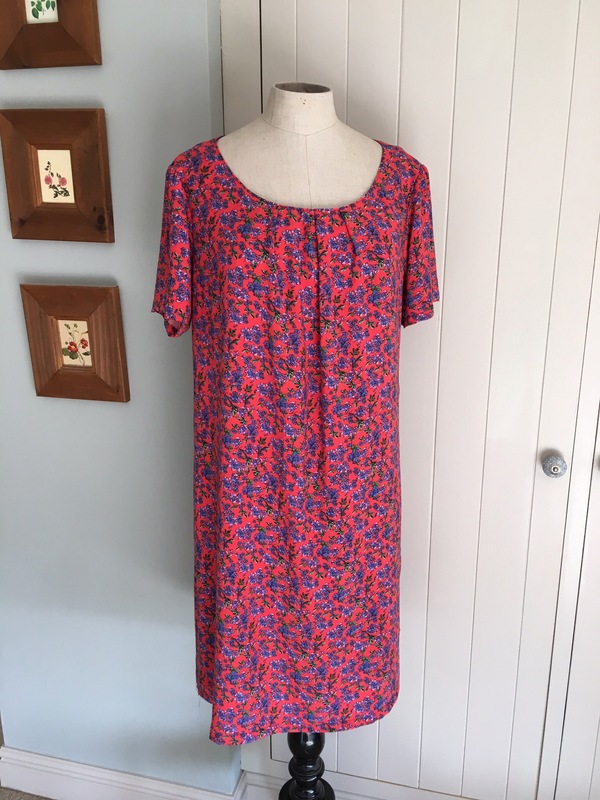 It is a thick polyester, has a good drape and it was £5 for 3 yards! I don’t know why but I agonised over which size to make. Possibly because the fabric had absolutely no ‘give’ to it what-so-ever but also because of the design. I didn’t know how roomy I wanted my finished garment measurements to be. My actual measurement being size 3, I decided to make size 4 as I hate my clothes being too tight. Cutting out was easy as its a really thick quality paper but the fabric I had chosen was a complete nightmare. It frayed, it moved, no stretch (at all) and because I bought it as a vintage one off, I knew I only had just enough. No mistakes, no pockets, concentrate…. My first mistake was sewing the skirt pieces the wrong way round (I wasn’t concentrating and hadn’t bothered lining up the notches). Thank goodness the thick polyester was very forgiving when unpicked!! Sewn back the right way and fabric aside, the pattern was a pleasure to make. I had cut out the size 4 skirt and it made me look like I should be coming in at 2:1. Was it possible my hips could look that wide…clearly yes. I looked at the pattern and you could clearly see that it bulged on the pattern too. I graded the skirt down to a 3 in the middle, a new couple of seams and the skirt fitted perfectly. I also had originally cut it 2″ longer as I had done some research and a rather short skirt was one of the complaints. I will definitely be making this pattern again but not with temperamental fabric like this!! I shall make the pocket version next time and I shall make one in a stretch fabric too. 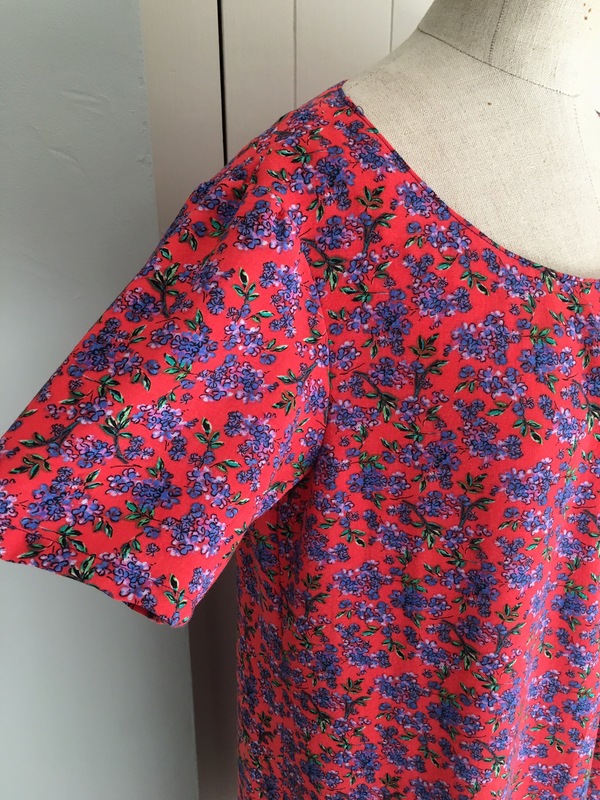 I read on Tilly Blog that you don’t have to change the pattern for jersey fabric, although it’s best not to make pockets as they can look a bit saggy! 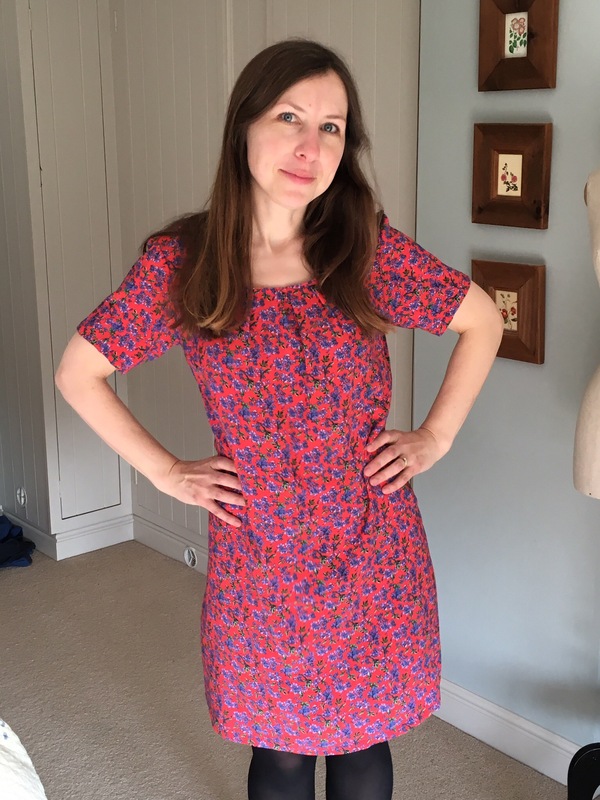 I found the pattern easy to follow but although I payed particular attention to the finished garment size, the end product was really roomy waist down. I took a little bit more off the seam (about 1/2″ each side) and that was enough. 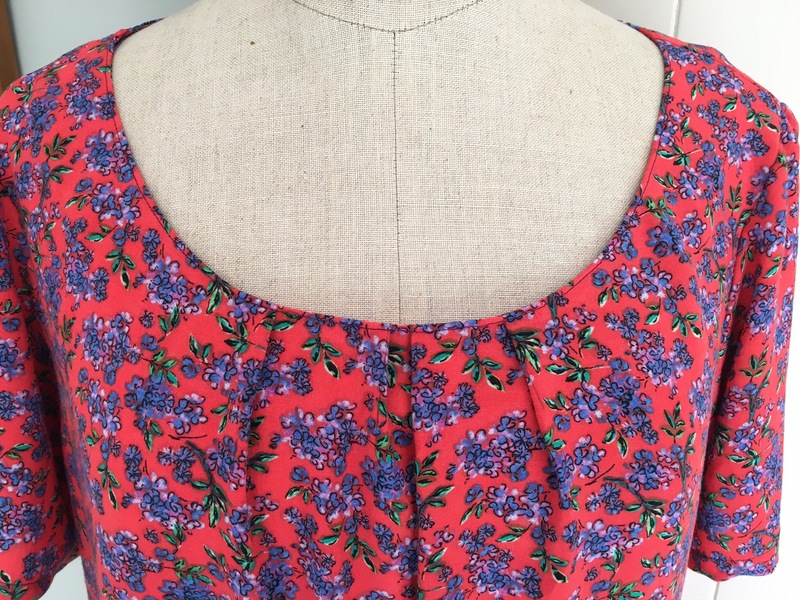 I also found the neckline rather high for my taste so I shaved 1/2″ off the front too. I really enjoyed the fiddly bit of fitting the sleeves and the end result of the neat little sleeve was worth all the pinning. I wore my first attempt to a friends birthday bash and was so pleased, I went straight on to make my second. I wanted my next one to be more structured so I used a cotton poplin that I had bought from Coolcrafting. It is an exquisite shade of grey and reminded me a little bit of Liberty fabric! Cutting out was a breeze and because of the previous sizing issue, I graded the pattern one size smaller below the waist. I have no idea why, but this time it really gaped at the back on the neckline. I was so frustrated because it hadn’t happened before !! A quick emergency text to my sister in law and it was decided that I should put a couple of ‘garment saving’ darts in the back. Hey presto, they worked thank goodness… panic over, or so I thought. Using the poplin which is quite stiff and doesn’t drape that well made it really quite shapeless and I began to wonder if I would ever wear it. Out popped the scissors and before you could say ‘shapeless shift dress’ it was a top and I’m much happier with the result. in fact…I wore it all day !! Will I make another Laurel ? I most certainly will but I will use fabrics with draping properties and I’m going to lower the neckline a bit more. I will also try to sort out the gaping neckline by adjusting the pattern.